We are pleased to invite you to VIV Europe 2014 held at de Jaarbeurs in Utrecht The Netherlands from May 20 – 22, 2014. Please join us at our stand 07E064 and find out how we can help you further your business. Don’t miss out and register for a free entrance badge now using the link below. We are looking forward to seeing you in Utrecht!! The “Dutch Poultry Centre” awards TopKip the Preferred Partner Label. TopKip has been inducted as a member of the “Dutch Poultry Centre” and has earned the Preferred Partner Label. This label is a quality guarantee that embodies Quality, Knowledge and Innovation. DPC’s mission is to showcase and spread recognition of the very strong reputation and image of the Dutch Poultry Industry worldwide. In addition, DPC protects this strong and reputable image from deteriorating. The Dutch Poultry Centre is a platform through which leading Dutch companies, public and private Institutes, etc. affiliated with the poultry sector, present themselves in international markets. The tangible proof is in this label and only DPC members are allowed to carry it. In its particular field, TopKip underwrites the meaning, intentions and requirements of the high standard of this label fully and lives up to its expectations. Together with other members of the Dutch Poultry Centre, TopKip maintains its high reputation. Topkip introduces new videos of both its In-Line Combi Chilling System and its animal friendly Stunning System while in action. These videos were taken in real life settings. In order to get a better impression of these innovative systems a new page has been added to the TopKip website. Please go to System video's on our homepage to view the videos. We think you will find them very interesting. Tailor-made stunning for every bird. The new “head-only” stunning device is a legal electrical stunning method without any use of water. Based on the head resistance of the birds, they will all receive the exact current rate. A very high accuracy and limited carcass and meat defects are the results. Read more.. Larger birds require high-speed cooling. Poultry companies in the fresh and processed poultry meat segment increasingly prefer larger birds. These companies frequently tend to forget that it takes more time and energy to lower the body temperature of these larger carcasses after evisceration than the traditionally-sized birds. 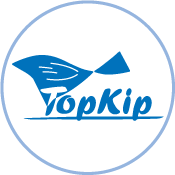 TopKip of the Netherlands recognised the issue and created a solution that it believes gives processors many more rewards. Read more..